In the heart of little old London, you'll find one of Broadway's biggest musicals donning its tap shoes at one of the West End's biggest theatres. Mark Bramble once again directs 42nd Street, for which he received a Tony Award for reviving in 2001. It's a bigger, glitzier and much more outrageous affair, and it is utterly gorgeous to watch. Assembling a cast of over 50 performers to fill the large Drury Lane stage, this is the biggest revival of 42nd Street yet, and no expense is spared. There's a fairly simplistic design by Douglas W. Schmidt, which allows the dancers to take full reign of the stage, and for Roger Kirk's incredibly colourful costumes to dazzle centre stage. Sheena Easton is, apparently, the main draw of the show as diva Dorothy Brock. She's surprisingly witty and dry, with a husky voice to match. Her rendition of “Boulevard of Broken Dreams” is vocally stunning. Clare Halse has the necessary charm as naïve chorus girl Peggy Sawyer, and is jaw-droppingly light on her feet, giving the tap numbers all the necessary pizzazz for a star performance. Emmerdale's Tom Lister also impresses with a Sinatra-esque voice, particularly in the finale number. But it's once again the supporting roles that dazzle the most. Jasna Ivir as songwriter Maggie Jones is hilarious, Emma Caffrey as Anytime Annie is wonderfully charming, and Stuart Neal amazes with his tenor voice as Billy Lawlor. It's an incredibly strong company who look like they're having the best fun on stage. 42nd Street is one of the rare musicals where you know every single song sung. Harry Warren and Al Dubin's original score gets the toes tapping immediately, and whilst the lyrics may not be as acceptable in current times, every rendition is wonderfully revived. In the current climate, it's simply wonderful to see good, old-fashioned musical theatre returning to the stage. For a couple of hours, you can immerse yourself in the glittering world of Broadway, and come out realising there’s a “Sunny Side to Every Situation”. 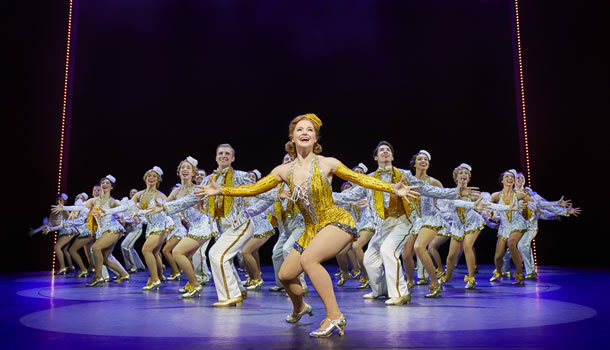 42nd Street is truly dazzling, and you can only hope it encourages the golden era of musicals to crawl out of the woodwork. Annie Get Your Gun, anyone?